Don’t panic, it is I: the almighty irresistible intriguing infectious god forgotten revengeful and fearful regrettable, but above all frustrated as a dark scarecrow looking people eating giant black midget. I received the Black-Hooligan-Snot-Camouflage-outfit husband and daughter ordered for me. Too bad for them that I now have to overwhelm them with all kind of practical sarcasm irruption attacks and buy them cursed nicknnacks, evil-smelling second hand socks to hide them in their work office and give them evil smells and smiles for the rest of their life’s. As you can see the snotty head barrier thing isn’t a lot of fabric. In fact it looks like a piece of an atrocious lurid implementation of Little Red Riding Hood except this Riding Hood is more of a Black Hooligan Snot Camouflage. 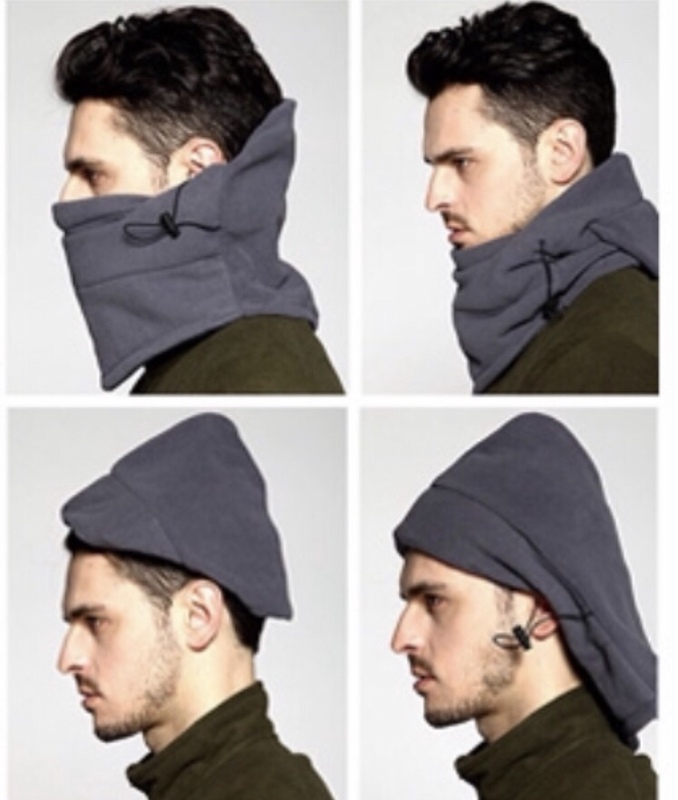 According to the advertising picture they want you badly to dress yourself with some kind of gnome like cap. Who thought of that?? Was that person run away from some disturbed institution? Why do they let such people work as designers? Are those Millenials? They have some bizarre minds to see the world you know. Our lifes are practically in their hands. Before you know it we have to dress ourselves as horrific little gluten free YouTube stars, you know with look-a-like-mask and all, with handy drawstrings around your waist so you can pull real hard and you look for ever skinny. Anyway the stupid thing smells like H***. Everywhere I walk, people turn around and make really weird nose gestures. There even might have made a few people unconscious because of my insane gangster perfume. Because of this irresistible chemical fragrance, I now defy the streets with a most awkward drunk-look and I think I am being drugged by this midget cap thing. At least that is what husband told me I look like when I wear this thing. A couple of times he had to save me from a French fries corner where I had walked right in apparently and I stood there with a nice big paper cone with delicious fries stuff. But then came the huspup smashing it out of my hands with the reproach slash question if I had forgotten that after I should eat the fries I would be vomiting for at least the coming six months. Because…. yes..because..
What I was doing with French fries? Well to make sure I have a nice smell in my rotten gangster cap I wanted some fries to rub it in the fabric real good. Wouldn’t you want to have a delicious French fries fragnance on your clothes when you are not able to eat the stupid fat fries. Well I do. But I’m weird; I am allowed. Okayy; now the short continuation of the everything-you-need-to-know-about-Black-Hooligan-Snot-Camouflage-outfits review. How in general does the thing fit? Well if I überhaupt accomplish to manage to drag the thing over my head and pull it over your nose; I totally almost suffocate myself from this incredible heat. I never knew I had this glowing radiator alive in my mouth. I always thought prehistoric dinosaurs had this fire occurrence coming out of their mouth; can it be there is still a little copy alive in all of us human species? Apparently when you breath while your mouth is covered with some sort of retarded piece of fabric it’s gonna get pretty hot in there. So DON’t USE the stupid fabric as Balaclava; I almost fainted from the heat and if you have some non legal business to do, you’ll have to carry an oxygen mask beneath it. 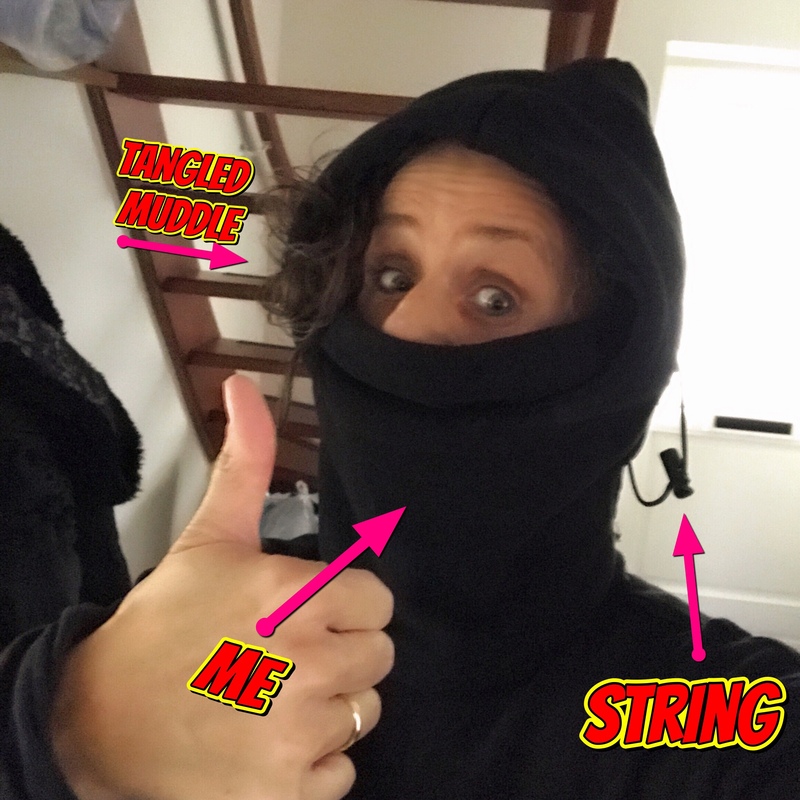 Ofcourse you don’t have to use the whole Balaclava-look because you’re a decent person (except me some times) and I just take the normal scarf function which is to hide your mouth and or nose with only a part of the fabric. Well once you searched for 25 minutes which part is your own sweater (which of course ended up with pulling your underpants over your head) and which is the right part to put over your mouth, the whole thing slowly slips down your chin every two seconds after you’ve pulled it up again. Which is no fun at all when you are just in the middle of making covered weird comic faces to stupid people. Just when I was arguing with a trinkets shop salesclerk about that I didn’t want to purchase a real looking totally snapped and probably also many times snapchatted cranky cat robot who is sitting in front of the shop trying to making his way to internet fame and is waiting for the day he turns into a real deal copy cat just like Pinocchio did, but then without the nose thing, because usually cat’s don’t lie ofcourse; and yes I know that Pinnocchio wasn’t a cat (yet); the most ambitious and most annoying salesman ever had to witness the most insulting crazy weirdo face he’d ever seen in his entire career while pushing and shoving people his merchandise through their throat. That because the snot-thing slipped off my nose and mouth leaving me standing there with my outstretched tongue combined with a real mean exorcist look with the help of some spirit ghost friends I have as a Psychic which resulted in a scary moronic mentally deficient appearance. This tactic is not recommendable because it’s like the falling of a shower curtain and they instantly see you totally naked in front of a whole audience of 40.000 people while doing the hippy hippy shake. Meantime, despite my gruesome dangerous tricky look, as stiff as the salesman was, he suddenly became rather fanatic after I said that we would discuss the ‘don’t-touch-the-robot-cat’-cat when we got home. But I think I should write this in another blog about this cranky cat and it’s not so gentleman salesman person figure, because this particular blog is about if you can survive a Snot Camouflage ski/criminal practices Balaclava. So to finish this amazing accurate but snotty review of this smelly, suffocating, crime-fashion thing. Pulling the two strings to keep it tight is also absolute NO option, because you end up looking like Octo (from Spongebob) or sneakers busy with the last steps on this earth. And your snot will end up somewhere where you absolutely want it to land, but probably they don’t want it. Does it protect from the cold? NOOOOOO: not really!! Period. Am I going to use it? Well….. no, not really, sometimes, maybe, yes because I don’t want to disappoint my family for giving me this amazing thoughtful inferiority complex and above all fearful and stinky gift. I think I just keep it in my bag until I see people I want to hide from or when I get an uncontrollable compulsive rob hunch. Warning: don’t stick your tongue out when you’ve got the thing over yo r nose and mouth because you end up with a bunch of smelly gross fabric hair in your mouth.